In February 2018, Palmusic UK, in association with Sarum Concern for Israel/Palestine and Brighton and Hove Palestine Solidarity Campaign, presented Omar and Tibah Saad in concert with two special guests, Wissam Boustany and Iyad Sughayer. The tour was held in support of our students Omar and Tibah, who are currently studying at the Royal Conservatoire of Scotland. 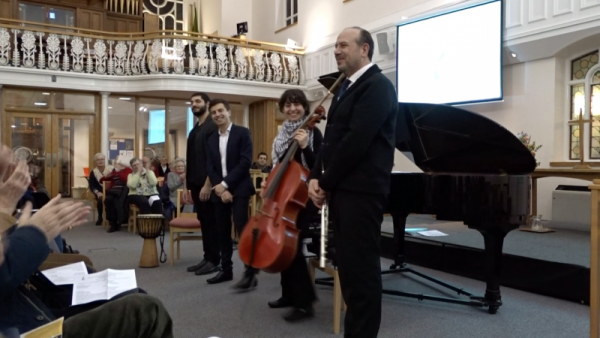 We are pleased to announce that the two concerts managed to raise over £ 4,000 for our Palmusic Scholarship Fund that enables young Palestinians to study music at UK Conservatoires every year. The young musicians enchanted the audiences with their beautiful music and talent and their message of peace and hope. We would like to thank all those who came to our concerts and supported our gifted players. Your warm welcome and enthusiastic support inspire us to continue nurturing young Palestinians and showcasing Palestinian talent and culture. We would also like to extend a special thank you to Sarum Concern for Israel/Palestine and Brighton and Hove Palestine Solidarity Campaign for making these concerts happen. If you were not able to attend the concerts, you can still contribute towards Omar’s and Tibah’s Scholarships by donating through our website or by sending us a cheque at Palmusic UK, 1 Gough Square, London EC4A 3DE. Your support can offer a life-changing opportunity to talented young students. “The whole concert was super […] What a night to see that Church packed – terrific“. “All four players brought the concert to a very moving end with a rendition of an Arabic song with Tibah on voice and cello, Omar on drum, Wissam on flute and Iyad on piano”.